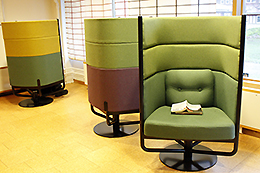 Using almost exclusively previously used furniture, the Valla Library has created at least 50 new study places of assorted designs. The places are also a test in preparation for the move to the new student building. The “Ikaros” area has been cleared of both books and bookshelves, and several types of seating with desks have been installed here. The large rugs give a feeling of “home from home”. The library will move into the new student building on the Valla campus in 18 months’ time. One of the purposes of the new study places is to test various ideas before moving to the new building. Are the six rotating armchairs, and their soon-to-be-installed footstools, for example, a good idea? “The good stuff at Återbruket disappears in a few hours, just like a second-hand shop. You have to keep your eyes open and pounce,” says Solveig Lundin. In the room on the fourth floor where fiction used to be shelved, a makerspace and a digital laboratory are being installed. 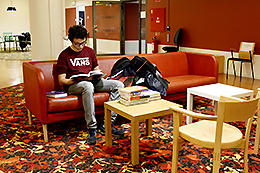 When this room is not in use, the spaces there can be used for study. Large bean bag chairs and a hammock are other examples of newly purchased furniture, and electrical sockets are to be installed in the ceiling. One idea being discussed is a tailor-made seating group built from freight pallets in one corner. “We probably won’t win any design prizes, but what most students want is just somewhere to sit, close to an electricity socket,” says Kristin Krantz.